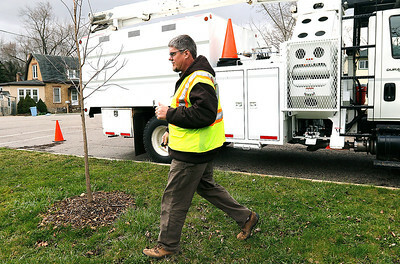 H. Rick Bamman - hbamman@shawmedia.com Algonquin General Services Superintendent Steve Ludwig arrives Thursday, April 7, 2016 on a work site to check on one of his crews working to remove a dead tree along North Harrison St. in Algonquin. Ludwig has had to take on additional roles including managing a team of mechanics as the village had Ludwig take on additional roles instead of filling the positions. 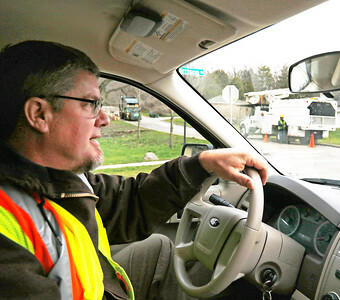 H. Rick Bamman - hbamman@shawmedia.com Algonquin General Services Superintendent Steve Ludwig arrives at a work site on Harrison St. The village had Ludwig take on more roles instead of filling the positions. 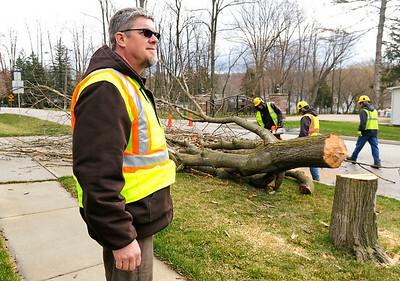 H. Rick Bamman - hbamman@shawmedia.com A Village of Algonquin forestry crew trims a dead tree for the chipper on Thursday, April 7, 2016 as General Services Superintendent Steve Ludwig observes the job site on North Harrison St. Ludwig took on additional roles when the village decided not to fill vacancies. H. Rick Bamman - hbamman@shawmedia.com Villafe of Algonquin mechanic Marc Martinez returns Thursday, April 7, 2016 to continue regular matainance on a fire engine at the municipal garage on Meyer Dr. General Services Superintendent Steve Ludwig has had to take on additional roles including managing the team of mechanics. 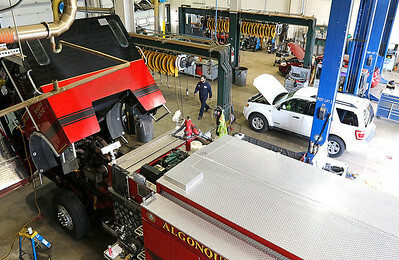 Villafe of Algonquin mechanic Marc Martinez returns Thursday, April 7, 2016 to continue regular matainance on a fire engine at the municipal garage on Meyer Dr. General Services Superintendent Steve Ludwig has had to take on additional roles including managing the team of mechanics.